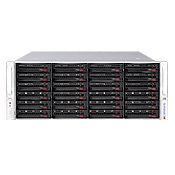 These are our 4U storage servers with dual AMD Opteron 6000 series CPUs equipped with reduadant power supply, 24 hot swap capable SAS/SATA drive bays, and up to 16gb of system memory. The fixed internal drives can be selected for OS installation, to be separated from the removable drives. When you have more drives selected than what the SAS controller can support directly, please select the SC846E1 case which comes with SAS expander.